This season marks the 30th Anniversary of Watford’s first season in the top division of English Football – Division 1 as it used to be known. 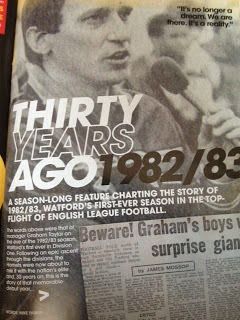 To mark what was an amazing season for the club there will be a feature in each matchday programmes this season documenting 1982/83 from start to finish. 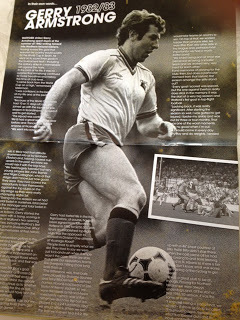 Each will be 8 pages long and feature photos from back in the day, clips of newspaper articles and a interview with a key player from the team that season. On top of that will be the words of From The Rookery End’s very own Mike Parkin. Mike has been thumbing through the archives, chatting to the players and will your guide through the games of that season and the events in and around Vicarage Road. 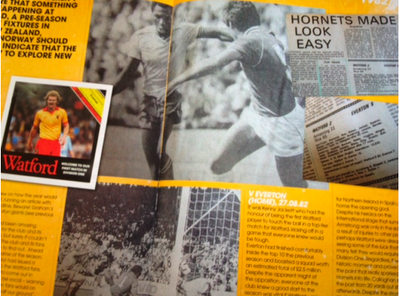 If you grabbed a programme at the Watford vs Ipswich game then check out page 39 where you’ll read about the start of the season when the club took on Everton and Southampton, plus there’s an interview with the scorer of the Hornets first ever goal in the top flight – Gerry Armstrong.